Songwriting can help academics distil research, hone communication skills and reach diverse audiences. Meanwhile, creative arts like songwriting and music production can powerfully engage young people from all backgrounds. Writing songs with the public is a great way to turn routine engagement activities into memorable and meaningful experiences. Academics at Oxford University have worked with Jonny to create interactive activities that explain their research simply and quickly, enabling passers-by to learn enough to contribute a verse to a song. 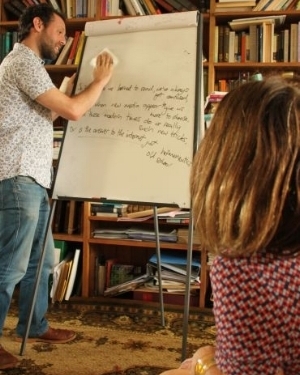 At Oxford University Jonny helped researchers from all disciplines translate their research into song. The songs were performed across Oxford, allowing researchers to share their work simply and succinctly, and gain confidence in engaging the public. Find the songs here. A group of young people with no prior interest in science were brought together with researchers from the National Survey of Sexual Attitudes and Lifestyles (NATSAL), plus songwriters from the Roundhouse and Wellcome Collection. The participants conducted their own research and translated findings and responses into song. The young people left with a greater knowledge of the work that scientists do, a deeper understanding of issues surrounding sexual attitudes, songs for their showreels, and new friends. In turn the researchers learnt new skills to enhance public engagement.